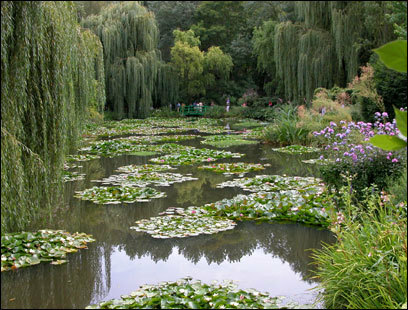 Near the end of his life, Claude Monet focused on this pond and gardens at Giverny, a village near Paris. The familiar Japanese bridge has been replaced twice to preserve the view the artist saw. GIVERNY, France -- The garden breaks all the rules the French hold dear about domesticating plant life into straight lines. It's a joyous riot of color, abundant and flowing, a corner of nature just barely tamed, a paradise made to order by an Impressionist to please the eye and provide endless motifs to paint. "What I need most are flowers, always, always," said Claude Monet (1840-1926) . Eight decades after his death , his garden still grows. At Giverny, his home for the last half of his life, his famed garden and lily pond, his house and studio are now among the great attractions of France, a destination ablaze with flowers. Monet, early a rebel, became not just accepted but rich and famous, cultivating his garden and remaining productive into old age. He went nearly blind in the final years even as his artistic vision matured and expanded in his late water lily paintings. Maintaining the grounds is a year-round job for nine full-time gardeners and two apprentices, and even during the dormant season they are busy replacing shrubs and trees, and preparing plantings for spring and summer. "In winter the garden sleeps, but the gardener does not," Gilbert Vahé, the chief groundskeeper, says. Vahé loves early spring when the buds begin to pop, although he views his job in the broad time frame of the seasons as someone orchestrating the garden's "sequential" progress. Like fireworks, the garden changes and unfolds, building to a climax in autumn. By late September, the clusters of bright flowers tower over the heads of visitors. As you stroll the garden's alleys, you feel as though you're submerged in the colors of an artist's palette. Vahé, 58, took part in the research to restore the garden after it had gone to seed over many years after Monet's death. The Monet family willed the property to the Academy of Beaux- Arts, and Vahé was one of the early hires before a foundation was established in 1977 as a public legacy. Thirty years ago, Vahé and a foundation curator interviewed whomever they could find who had worked on the garden or knew Monet's home as it once was -- friends and family, a former gardener, even seed and fertilizer company employees. The researchers also had early photographs of the premises, as well as many of Monet's letters that detail his passion for gardening. "I would walk around with people who were familiar with the garden. They told me here's where the jasmine grew back then, outside Monet's atelier," says Vahé. "The people I talked to who knew Monet were in their 70s. Some of his children then were in their 50s." While the garden today is thriving, it is permanently maintained much as it was in Monet's lifetime. Would he be happy with the garden as it is now? Vahé hesitates to answer directly, as if Monet's watchful spirit might be hovering over the garden. "He was demanding about his garden, as he was about his painting," says Vahé. "Always he wanted to push things further." Vahé explains that Monet's enthusiasm for his garden took second place only to his art. In the early years at Giverny, he did the gardening. He rented the former cider-press house on the property when the grounds were covered with fruit trees and cypresses. Seven years later, in 1890 and after a successful exhibition of his paintings, he bought the house. As his wealth grew, his garden evolved. He remained its architect, even after he hired seven gardeners . That's fewer than today, but they worked up to 13 hours a day, Vahé points out. The best place to view the entire garden is from the bedroom of Monet's pink house with green shutters. In warm weather, the French windows are luxuriously thrown open, and visitors can survey from above the three acres of flowers and flowering trees. The interior of the house reveals the taste and temperament of a gentleman artist. The walls are covered with the hundreds of Japanese prints that Monet cherished and collected. Monet also loved good food and wine. He had eight children by two marriages, and he lived in style. The yellow dining room and well-appointed kitchen, with its gleaming copper pots and pans, appear ready to receive the family or guests for a festive meal. In a separate building is the enormous, skylit studio where he worked on his series of water lily paintings. When Monet painted there, he allowed no interruptions from visitors. In a nod to commerce, the studio today is occupied by a busy gift shop. Toward the end of his life, Monet's attention shifted from his flower garden to the pond and water lilies at the far end of the property. Monet used to walk along the pond's path, stopping at intervals to meditate upon what he once called "the mirror of water that changes its appearance every moment" with each passing cloud or breeze. Vahé notes that the Japanese bridge so familiar from Monet's art has been replaced twice because of moisture rot. The pond is regularly cleaned of fallen leaves. One of Vahé's workers stands astride a shallow-bottomed boat, like a gondolier, and nets up debris that might otherwise choke the lilies. As Vahé makes his rounds, he is too task-oriented to dawdle for long, but never too busy to stop when he spots a weed. His favorite gardening tool is a "serpette," an implement resembling a hooked pocket knife. While he was being interviewed, his serpette made quick work of several weeds. Vahé is a man happy in his work. He likes the challenge of marshaling his staff and solving problems. Is there a downside? "When plants have a malady, I feel like they're like my babies." Monet welcomed friends and visitors to his home and garden, but it's doubtful he could have envisioned the throngs of tourists in high season nowadays. Yet the garden is so lush and beautiful, one tends to get lost in this refuge without minding the crowds. As keeper of Monet's garden, Vahé is glad to share it with visitors. "There's so much misery in the world," he says. "This is a good place to escape to for a few hours." Robert Garrett can be reached at grobgarrett@aol.com. An easy day trip from Gare Saint-Lazare, the Paris station depicted by Monet in the era of steam trains. Take Paris-Rouen line to Vernon; from there a bus ( $4 round trip) departs frequently to the Monet house at Giverny. Daily except Mondays 9:30 a.m.-6 p.m. April 1-Oct. 31. Adults $7.50. Once a hangout for painters visiting Giverny, the restaurant serves simple country fare and generous salads, $20-$27.